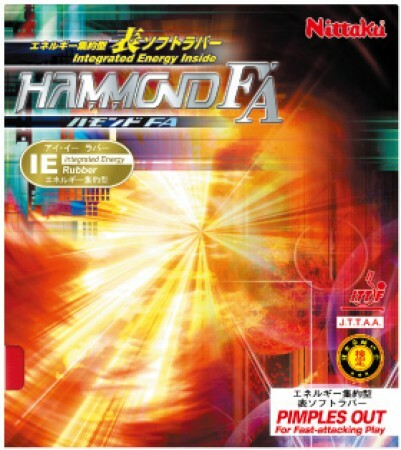 The pimples out version of Hammond. IE technology enables to increase the energy e_ciency that ensures maximum speed with amazing ball control. I felt it was soft, when I tried it, I felt hard. Also, it got rotated firmly when biting into it, and when rubbing it slid naturally. I think that it is an easy-to-use table rubber that is easy to use from beginners to advanced users who also rotate like the back and slip like grain height. Although it is the main back of now, I used this table at the main back for a while. "Turning the table" will take a turn. It is a rubber that easily moves from the back. Features are speed and control. It feels good to play it! Speed ​​counters are decided comfortably as well. Receiving for the drive is also quite easy. You can return balls with low trajectory by erasing the opponent's rotation with just good feeling. I like the most on the table rubber and I am still playing on the racket. Even in the way of backing up, I can deal with it in the first place, so I think that it is worth trying those behind the scenes. It will take rotation as much as it can be used without incongruity even if it shifts from the back software to the table software. If you are looking for a table software that can drive, I think that it is no doubt if choosing this. Just by talking to each other normally, the opponent places on the net. It is also a feature of this rubber that you can freely control as to push the opponent 's drive in a push or stop at the battle rally game. It is a rubber that can be used without incongruity even by people using table software for the first time. I painted and used glue until it went back. Still it is a perfect rubber for beginners to use. Please use it by all means! It is a sponge with elasticity and good grudging, because the seat is also caught, it feels very easy to rotate. Small skills such as Tsutski and stops are easy to rotate, and Chiquita is also easy to do. Although knuckle is not a touch saying that it goes out naturally just by hitting, if it hits straight straight it can be put out easily. In addition to being easy to use, there is also a table softness with the eyes, so it is perfect for moving from the back software.